Olaudah Equiano (1745-97) was certainly a remarkable man, and one whose name deserves to be remembered this year along with William Wilberforce, Thomas Clarkson and the others who helped to bring about the end of the transatlantic slave trade in 1807. His life was an incredible story both of adventure and of a man who managed to work his way out of slavery and become a successful businessman and best-selling author. Although born Olaudah Equiano, he was renamed Gustavus Vassa (after a Swedish noble) by the British naval captain who bought him in 1757, and used that name for the rest of his life. Equiano took part in many adventures and various schemes including those to resettle Africans in Sierra Leone, and also formed ‘The Sons of Africa’, probably the first organised black political group in England, who campaigned against slavery through meetings, letters and articles, as well as being active in the English radical left. But Equiano is also a great mystery. Despite the best-selling autobiography that did much to promote the abolitionist cause, there is still considerable doubt about the actual place and circumstances of his birth. And although his death made the newspapers at the time, there is no record of where he was buried, and little seems to be known about the details of what happened to his estate. His English wife, Susan Cullen, died in 1795, and his elder daughter a few months after him in 1897 , but when his only surviving daughter, Johanna Vassa, reached the age of 21, she inherited the large sum for the time of £950. His will is in the National Archives. Equiano disappeared without trace, and for many years his contribution to the movement was also largely forgotten, but in recent years much research and several books have brought his memory back to life. Joanna Vassa (as she is more normally known) lived until 1857, marrying Congregational minister Henry Bromley in her early twenties. People gather around the grave of Joanna Vasser as Arthur Torrington talks. 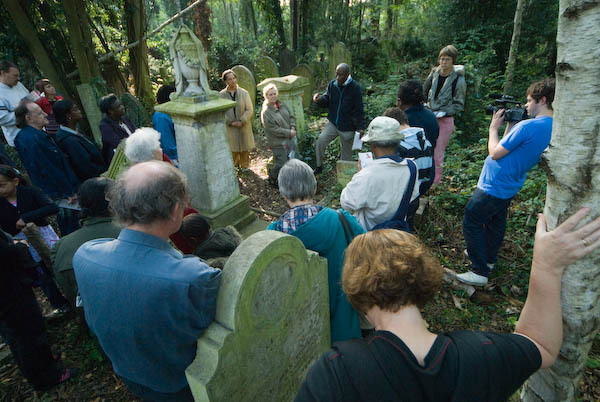 Arthur Torrington OBE, the secretary of the Equiano Society told us much of the story of the man and his daughter as he led a short conducted walk to her grave which was re-discovered in Abney Park Cemetery in 2005 in a badly damaged and overgrown state. It has now been cleaned and restored and parts of the inscription can be made out. Joanna, her husband and the second wife he married after her death were all buried in the same grave. There is no record known of any children from the marriage. 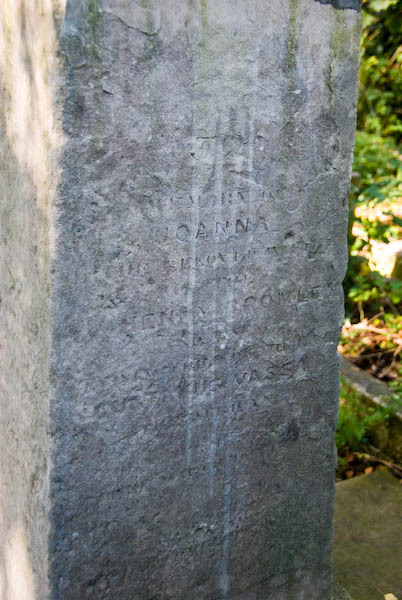 JOANNA, HENRY BROMLEY and VASSA can clearly be read on the gravestone, though some other words are vague. This entry was posted on Wednesday, October 17th, 2007 at 05:30 pm and is filed under My Own Work, Political Issues. You can follow any responses to this entry through the RSS 2.0 feed. You can leave a response, or trackback from your own site.